We offer a variety of outdoor canopies and event tents that are suitable for any outdoor event.The frames are constructed out of steel with a powder coated finish and the fabric is a 500 denier vinyl coated polyester. This means your tent will last for years of heavy duty outdoor use. 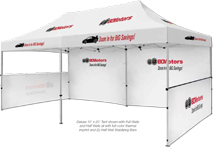 Event tents are available in a variety or colors and can also have a custom imprint or full dye sublimation printing process. 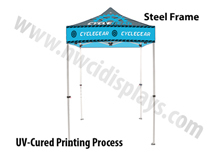 We also carry a full variety of outdoor banner stands that can accent your outdoor event tent. 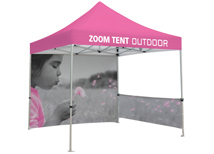 The Zoom outdoor event tent is a great option for events and outdoor festivals. Its available with full color printing making it easy to customize! It pops up in minutes and is very easy to transport. The Zoom 10x20 Outdoor Tent is our most durable and affordable 20 foot tent. Each Kit includes a carrying bag and stake kit! The Casita 5x5 outdoor event tent is the smallest tent we offer! This is perfect for smaller events. The frame is made out of steel so it is strong. The graphic is printed with a uv-cured process for vibrant and bright colors! This Casita 10x10 outdoor event tent is made with steel so it is it stronger than the aluminum frames. The graphic is printed using a uv-curing process on a special water resistant material to help protect from natural elements. The Casita 10x15 Event Tent is a great option for larger outdoor events! The height is adjustable and the canopy is printed with a special water resistant material! This tent qualifies for FREE GROUND SHIPPING! Get yours today! The Casita 10x20 Event Tent is a steel frame with a special water resistant canopy that helps protect from the natural elements! Add water bases for added stability in windier conditions! The deluxe line of Showstopper outdoor canopies makes assembly even easier than standard tents. The pop up frame has a hand crank and telescoping legs making assembly faster than other tents. The Showstopper Premium event tent has an aluminum frame for increased durability and lightweight transportation. 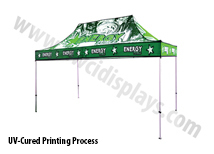 Standard color or full color printed canopies are available for this tent system! The Deluxe Showstopper 10x15 is a great solution for a larger outdoor space. There are many accessory options available including printing, lights, half walls, and shipping cases! The 10x20 Deluxe tent is our large outdoor canopy. This is great for large outdoor events where space is needed for products and/or customers. 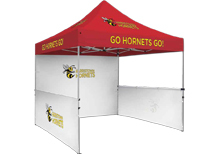 Printing is available on this tent to help brand your company! The standard Showstopper event tent is a great easy up canopy option. This outdoor event tent quickly and easily pops up resulting in shorter assembly times and a more professional appearance. Outdoor canopies and event tents are great for exhibiting outdoors. All of our tents are US made and are stocked in the midwest for fast shipping. The easy up feature in these tents makes them much easier to set up than standard tents. The deluxe model tent even has a crank to make the tent expand effortlessly. 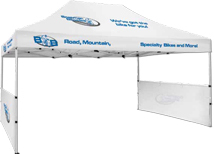 Although we sell trade show booths, outdoor event tents and canopies have the same traits as our portable trade show stands. Event tents are typically used at outdoor market and fairs. They offer shade and cover for the staff and products. 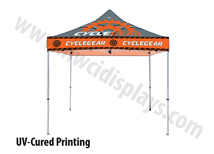 All of our event tents are available with full color printing to make any vendor stand out. They can also be used for indoor events and conventions to create a retail booth. The versatility of our portable event tents makes them useful in a variety of situations. Standard sizes are 10x10 but we also offer 10x15 and 10x20 versions. 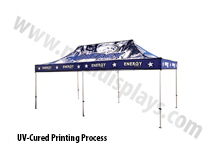 Tents without printing are available to ship right away, while printed tents take anywhere from 6-10 days to produce. 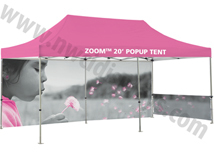 The Zoom event tent is our preferred brand for 10x10 outdoor canopies. It has a premium aluminum frame and quality standard canopy. There are multiple accessory options available at a reasonable price. 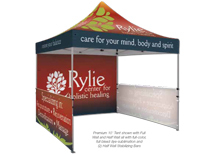 Full color printing is available on this tent and only takes a total of 6 business days! 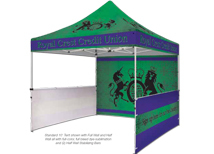 Printed walls are available for a low cost making it affordable to brand the entire tent. Every Zoom tent comes with a soft bag with wheels and a stake kit making it easy to transport and set up. The canopy on the Zoom tent is tight and snug giving it a clean, professional appearance. Showstopper event tents offer the widest range of options and sizes. The standard 10x10 tent comes in three quality levels to offer low prices and also higher quality products. There are a variety of options available including a flag mount kit, zipper walls, and ballast weights. The Showstopper is also available in a 10x15 and 10x20 size for larger events. Screen printing or full color digital printing is available. Lead time is 10 business days for full color printing so be sure to plan ahead. The Showstopper premium tents offer the best warranty at 3 years on the frame and hardware. The compact design of the Showstopper makes it easy to assemble and ship around.